New Delhi: NDTV Imagine, the general entertainment channel that was launched on 21 January has already had a better start than other new channels in the same genre, an indication, according to one analyst, that the channel's decision of linking its fortune to a flagship programme based on mythology has worked. While a 13-day rating might not be the best comparison of the performance of a channel, NDTV Imagine registered an average market share of 2.2% in 13 daysbetween 21 January and 2 February. In their first 13 days, Bindass and Zee Next, channels from the stable of UTV Global Broadcasting Ltd and Zee Entertainment Enterprises Ltd, respectively, had a market share of 0.4% each and 9X, launched by INX Media Pvt. Ltd, had a share of 0.9%, as per data from Audience Measurement and Analytics Ltd (Amap), an audience tracking firm. These three channels were launched last year. Analysts attribute NDTV Imagine's early success to differentiated programming and aggressive distribution, but add it's too early to say if the channel can retain the lead, and consistently grab viewers from market leaders Star Plus and Zee TV. "While most others took the soap (opera) route, Imagine went in for the mythology route in the form of Ramayan and that seems to have worked, at least, so far," said Salil Pitale, who heads the media practice at the investment banking division of Enam Securities Pvt. Ltd. "The NDTV brand, Karan Johar's backing and the management team headed by Sameer Nair seem to have worked. They have got a placement in prime band in most places, which shows they have struck coherent distribution deals," added Pitale. A channel that's in the prime band is carried in a prominent position (or channel number) by the cable networkthis increases the chances of a channel being viewed because a large number of TV sets in the country can still feature only a limited number of channels. Film-maker Karan Johar's Dharma Productions Pvt. Ltd is a minority stakeholder in NDTV Imagine Ltd, a part of New Delhi Television Ltd and Johar, also a popular talk show host, is the brand ambassador of the channel. "Ramayan hel-ped us cut through the clutt-er," said Nair, CEO, NDTV Im-agine. "All our shows have op-ened well. With good marketing and distribution, we shou-ld be able to sustain the lead." NDTV Imagine's Ramayan recorded an average TV rating of 1.5 in its opening week. While impressive for a show in its opening week, the number is still way below that of top ranking shows such as market leader Star Plus' Kahaani Ghar Ghar Ki and Kyunki Saas Bhi Kabhi Bahu Thi, two popular soap operas. The two shows, according to Amap data, have consistently registered ratings of 5 and above. Star Plus, the flagship channel of the Rupert Murdoch- controlled Star India Pvt. Ltd and Zee TV, the leading general entertainment channel from Zee Entertainment, together enjoy more than 70% relative market share. Increasing competition has seen some players trying to differentiate themselves from the rest of the crowd. Zee Next, for instance, has positioned itself as a "younger sibling" of Zee TV, with programming targeted at the relatively younger viewers of general entertainment channels. UTV's Bindass refuses to call itself a general entertainment channel. "We're a youth entertainment channel," said Zarina Mehta, CEO, GenX Entertainment Ltd, the UTV subsidiary that houses the Bindass bouquet of channels. "I don't mind if we are at the bottom of TRPs (television rating points) because our programming targets the youth and that's not as big as a universe that others target." Industry experts say general entertainment is a high-stakes segment, which explains the rush of competitors trying to make a dent in the market. Analysts say general entertainment channels together enjoy about 30% of total viewership, the highest for any single genre, while their share in the total TV advertising pie (by revenues) is around 40-45%. The competition in this space is likely to intensify as there may be three more launches this year. Reliance-Anil Dhirubhai Ambani Group, Viacom18 Media Pvt. Ltd and a yet-to-be named 50:50 joint venture between Alva Brothers, the holding firm of TV content producer Miditech Pvt. Ltd, and Turner International India Pvt. Ltd are set to launch their Hindi general entertainment channels sometime soon. Viacom18 is a 50:50 JV between Viacom Inc. and the Network18 Group. The serial that used to bring India to a halt in the late '80s is back in a new avatar. Yes, Ramayan is back two decades after it revolutionised television viewing in the country to woo the new generation. Again produced by Sagar Arts, it is going to be the flagship show of the new general entertainment channel NDTV Imagine to be launched on January 21. This time the epic comes in the form of a daily soap and will be telecast during the prime time. The channel is virtually putting a cat among pigeons as the slot is replete with saas-bahu serials during weekdays. "The whole idea is to cut through the clutter. We can't attract viewership for a new channel with yet another saas-bahu tale," says Sameer Nair, CEO NDTV Imagine. So religion is the only way to consolidate a scattered audience? "We are not looking at it as a mythological serial. For us it is a story, which has the highest mass appeal and the ability to bring the whole family together. The point is though the number of television homes has increased from around six million in 1987 to 118 million homes, most of the these homes are still single television homes. Also 560 million Indians are below the age of 25. So a whole generation has missed out on the televised form of the epic, which teaches us to care, share and be charitable ' values that we are fast losing out in the name of progress." Anand Sagar, who is directing the new Ramayan, promises the series is being shot on an epic scale. Anand, who assisted his father, the late Ramanand Sagar on the first version, says television budgets have increased in the last few years. "Today we can afford to use high quality animation and opulent sets to bring the epic alive for a new generation. Like Varun devta coming out of water." A visit to the Sagar Film City in Vadodara shows how the Sagars are leaving no stone unturned to recreate the era in the 40 acre facility. Sources say six crores have already been spent. Interestingly, Ayodhya and Janakpuri are just across the road and Gurukul is just a stone's throw away from Ayodhya. Anand says research has been done to understand the architecture of the period and Omung Kumar (of Saawariya fame) has designed the sets accordingly. Kaikayi's peacock-adorned bedroom is a spectacular sight. "However, we have made sure that the opulence doesn't come in the way of the simplicity and honesty of the story," says Shakti Sagar, who represents the third generation of Sagars and has worked with the research team. Talking of the contemporary touch, Anand reflects, "For today's audience we are presenting Ram more as a human being and less as a god." Echoing the sentiment producer Prem Sagar, the most articulate of the Sagars, says, "Ram was the ideal son, ideal husband and ideal human being." Ideal husband? Many in present generation might question the ideals of a man who abandoned his wife after agnipariksha on hearsay. Agrees Prem, "We do feel such an act doesn't match the character and genetic make-up of Maryada Purshottam. That's why we didn't show the episode in the first version. It was only after people's protest that we were forced to show Uttara Ramayan." Anand says he is not sure whether he will show the episode this time. For people who still know Arun Govil and Deepika Chikalia as Ram and Sita, now the characters will be essayed by newcomers. Gurmeet Choudhary plays Lord Ram, while Debina Bonnerjee plays Sita. The three key characters ' Lakshman, Bharat and Shatrughan ' will be played by Ankit Arora, Vije Bhatia and Lalit Negi, respectively. But for now all of them have been kept under wraps. Again with the younger audience in mind the new Ram is a lot more muscular and Sita much more curvaceous than the original. "Newcomers won't be an issue. Nobody recognised Arun, despite his film career, at that time," says Prem. Another connecting link is the musical score of Ravindra Jain. "I have kept the soul of the original intact, just the words have been changed. Suresh Wadkar and Kavita Krishnamurthy have sung the title track. The effort is to show Ram as an emotional man," says Jain. The serial is coming when the Raam setu controversy is on a high and a section is questioning the existence of Ram. Prem says they are creative people and have nothing to do with what the politicians are upto. "We are largely following Tulsi's Ramcharitmanas and Ram setu is very much there." A master with words Jain plays it down. "To me Ram setu means Ram se tu (you are because of Ram) and not the other way round." Ramayan on NDTV Imagine is being talked about for its grandeur and costumes. Nisha Sagar who's designed the clothes and jewellery of the epic drama says she's avoided taking reference from previously made serials. "It could have influenced my thinking and there was a fear of repetition," she informs. 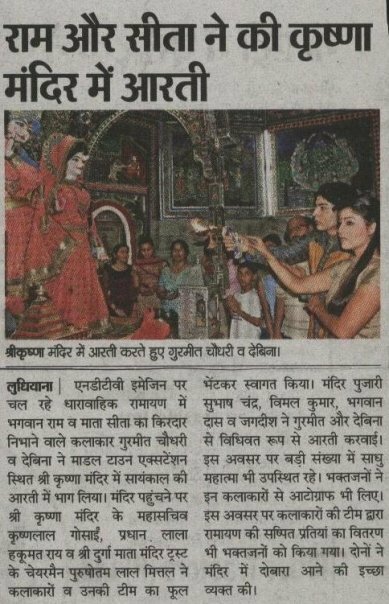 Instead she has referred to various paintings of Ram and Sita and visited many temples. She's sourced her materials from Benaras for the specially woven fabrics, raw and pure silk. The jewellery is from Jaipur. "I have categorically taken burnished gold for all my characters because that was the colours for the era. We have liberally used stones, kundan, colored mina and pearls. For Mithila, I have mixed gold and silver and used a lot of diamond with coloured stones because Mithila was the city of silver." Great care has been taken even in the embroidery work. "It is more of zardozi work with pure diamante and Swarowsky and semi-precious crystals drops. The motifs are inspired from the walls of various temples in Gujarat and South. They are auspicious with religious value and depict cultural values rooted deep in the psyche of Indians," says Nisha. The crowns donned by the serial's Gods heads are from Chennai. "It has a different carving and carries the emblem of Sun God, has a unique sheen to it and has precious stones studded in it. They are polished in gold," elaborates the designer who recently won the Best Designer award for Dhartee Ka Veer Yoddha - Prithviraj Chouhan. In a weird case of robbers having their devout nature spilling over into their line of 'business', thieves left costumes designed for Ram and Sita untouched, while taking away sarees and clothes worth rupees three lakhs from a designer's boutique in Juhu. Unidentified persons looted designer Nisha Sagar's store last week. Luckily for her, the thieves did not rob the costumes she had designed for the lead characters of Ram and Sita in the TV serial 'Ramayan' currently telecast on NDTV Imagine. Says Nisha Sagar, "I had designed clothes for Ram and Sita's marriage, and kept these in the shop too. Fortunately, the thieves did not pick those up. If they had, the shooting schedules would have been upset, as the marriage is to be shot in the next few days, and it would have been a great loss not only to me, but also the producer." The store is located in Swastik Complex near Kala Niketan at Juhu. Continues Sagar, "We had closed the shop at 8:45 p m that night, and at 10:30 a m, I got a call from the owner of a neighbouring store informing me that I had forgotten to lock the shutters. I rushed to the store, and found the locks on the shutter broken. The glass door inside is too heavy for two persons to have opened them. There must have been more than five persons involved in the theft for sure. "Two watchmen guard the complex, yet none of them know anything about the theft. When police questioned the watchmen, they are believed to have admitted they had gone off to sleep after 2:30 a m, and they claim they didn't hear any noise or seen any strangers entering the premises. Informs Senior Police Inspector Hemant Katkade, Juhu police station, "We are checking the modus operandi branch to find out if they have any record of thieves involved in stealing designer clothes. We have got some clues, and are working on the case. I cannot divulge any other details at the moment. "Besides 'Ramayan', Nisha Sagar is also designing costumes for characters of television serials 'Nagin' and 'Prithviarj Chauhan'. Congrats to The Ramayan Team! 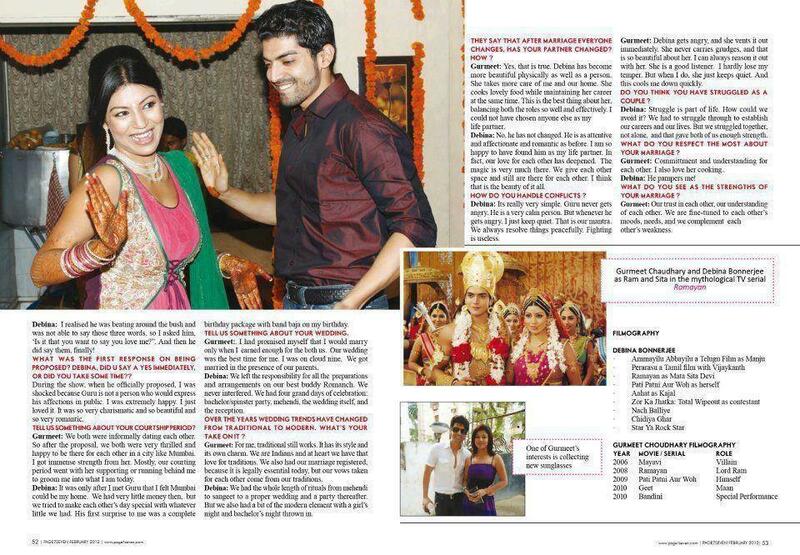 !Gurmeet and Dabina make gud couple! 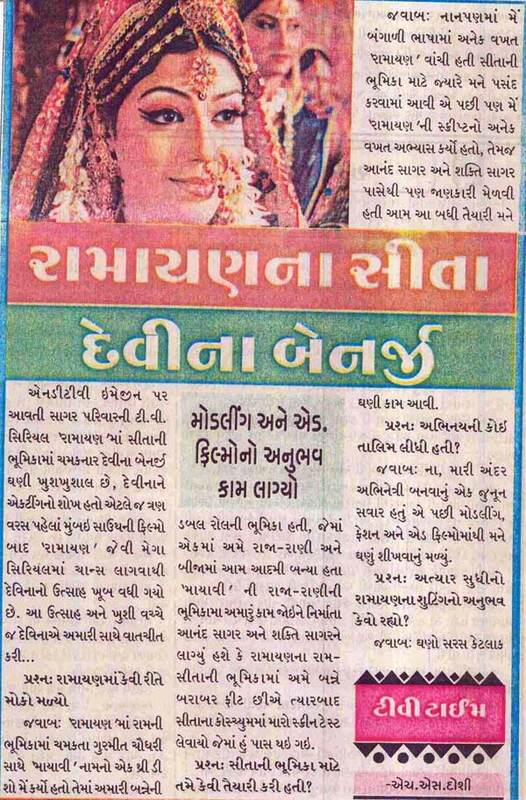 Congratulations to the whole team of Ramayan! This show will always be remembered...Janaki you need a special mention...beautiful thread... you deserve a huge round of applause for this effort...I hope an dpray this day brings luck , success prosperity love and happiness in the lives of GC and DB and everyone associated to it include us fans...GC DB need it big time today. Thanks Aditi! Don't appreciate me too much, I just copy pasted the layout of my Ramayan AT. 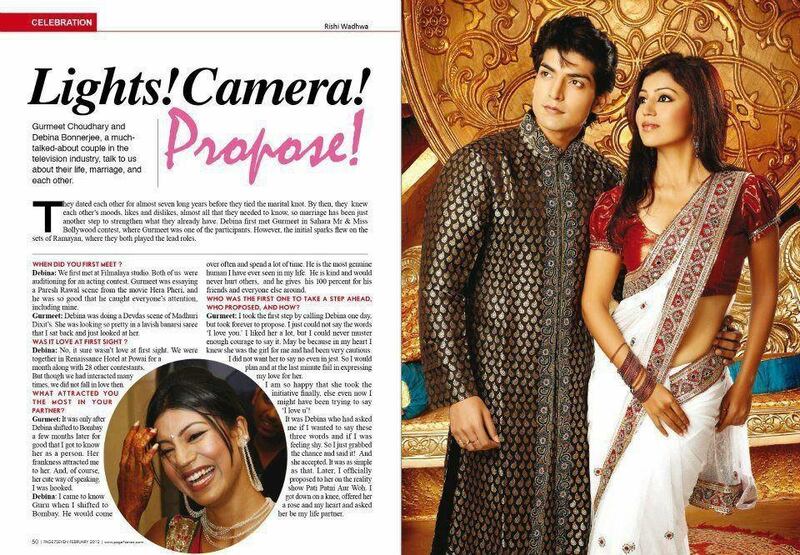 I also hope this day brings luck to Gurmeet & Debina. It's the anniversary of Ramayan and also the shooting of Nach Baliye semi finale. That's such an auspicious omen. 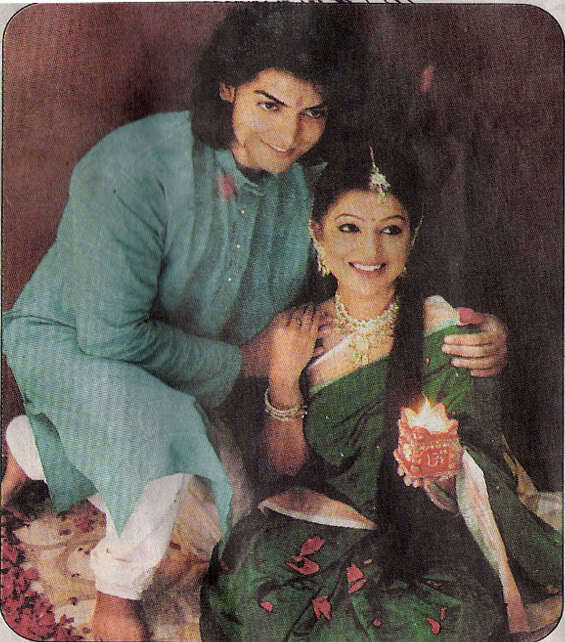 Yeah, Gurmeet & Debina looked so ideal as Ram and Sita. Thank you for the wishes.